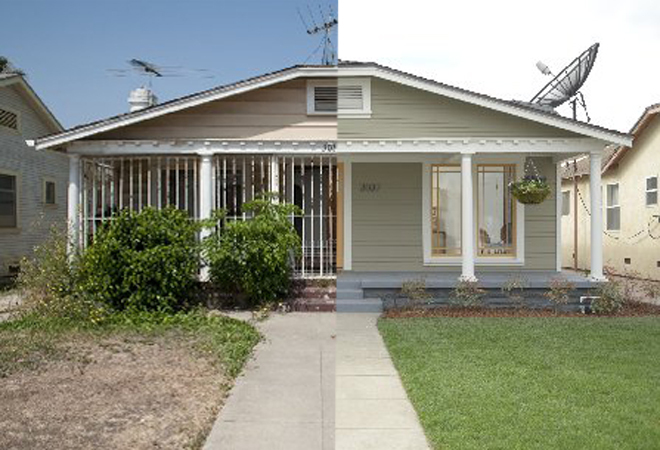 This dramatic makeover of this home in the Jefferson Park neighborhood near West Adams really caught my eye. ArtCraft Homes beautifully renovated the 1925 residence, but from the street, what was removed makes a much bigger impact than what was added. Taking off the steel bars, gates, and antennas that had engulfed this house revealed a charming bungalow underneath. I’m always telling people to tear down those bars. Making a neighborhood look like a prison makes people act like they’re in prison. It must have worked; there is already an offer on the property.